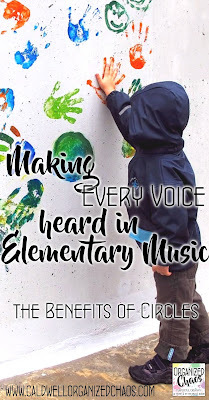 In any classroom with more than, say, 12 kids, it's a challenge to make sure every child feels heard- feels that they are an important contributor to the class and that their opinion is important. 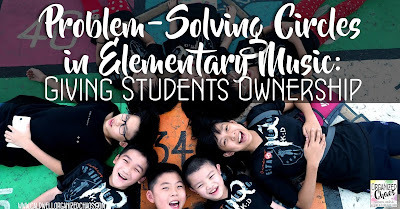 This challenge is only magnified when you factor in the short and infrequent classes that elementary specialist teachers tend to have, not to mention the hundreds of students in dozens of different back-to-back classes that the teachers are trying to keep track of! 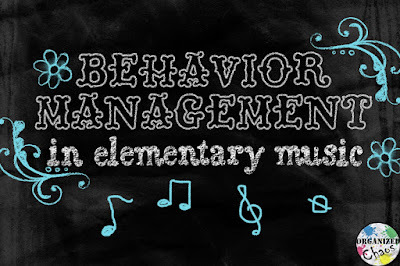 But the longer I teach, the more I realize just how important it is to "behavior management" to make sure every voice is truly heard in my classroom. If you've been around these parts for a while, you may remember me mentioning the training / professional development that I've been attending the last few years on improving school climate and, most recently, Restorative Practices (here's the official website for this approach to "discipline"). One of the key components to this approach that I've been learning about is the use of circles. "Circle time" is nothing new to elementary school teaching- I'm sure all of us remember sitting in a circle at some point to have show-and-tell time, or talk about the calendar or today's weather. In music class, I've been a huge believer in the benefits of drum circles (read about my favorite drum circle lessons, and my tips for drum circle logistics). There is something uniquely powerful about gathering in a circle as a community- everyone can see and hear each other, and nobody is positioned "above" anyone else. 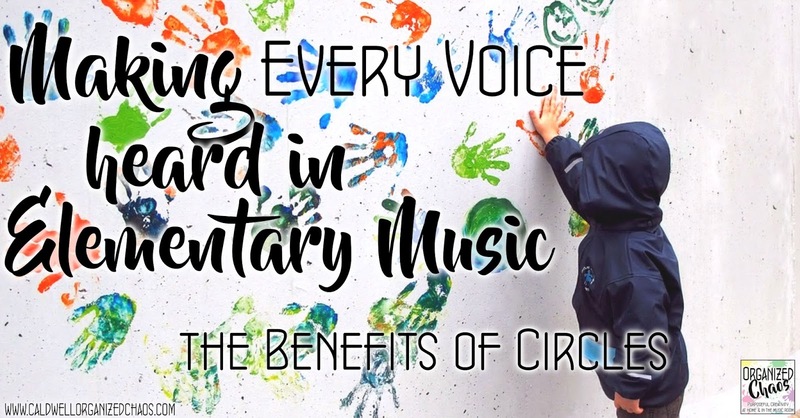 What I've learned through my recent training, however, is the benefit of making "circles" a more regular practice in the elementary music room. There are 3 types of circles I am planning to implement more consciously and regularly in my classes this year: community-building circles, problem-solving circles, and applied learning circles. Today I want to talk about the first one (since it is the one I'll be using most at the beginning of the year), and over the next few weeks I'll talk more about each of the others as well. Sidenote: if you're interested in learning more about Restorative Practices (which I highly recommend you do! ), please see if you can find a training session near you. Here's a good starting place to find opportunities in your area. What I'll be sharing here are my own thoughts on how I am, or plan to, apply the general strategies and frameworks to my own teaching situation. I'm not using the "official" terminology here- I don't want to replace actual training- but basically the idea behind what I'm calling "community-building circles" is to build community by providing structured opportunities for every child to share something about themselves in a fun, non-threatening way. What is your favorite color/animal/sport/season/food? What is your favorite instrument/musical genre/performing artist? Tell me about one of your heros. Tell me one thing you love/appreciate about the person to your right. Tell me one thing you love about yourself. You get the idea. The point is to pick a topic that is non-threatening and doesn't require too much thought, but gives everyone some insight into each person. This is the perfect way to get to know students, which can be difficult when we have so many for such short periods of time! And once the students get used to the procedures, the circles generally don't take more than a few minutes. 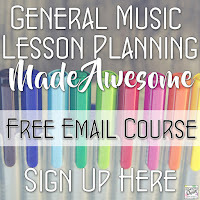 Often by learning about your students, you can tie those interests into your lesson planning- maybe you find out that tons of kids in one class are really into Mario, so you include a reference to the Mario theme in one of your lessons on articulation. Or maybe it gives you some insight into "That Kid" that you're struggling to connect with- if you can get them to tell you something about themselves, it opens the door for more conversations to start fostering that relationship. 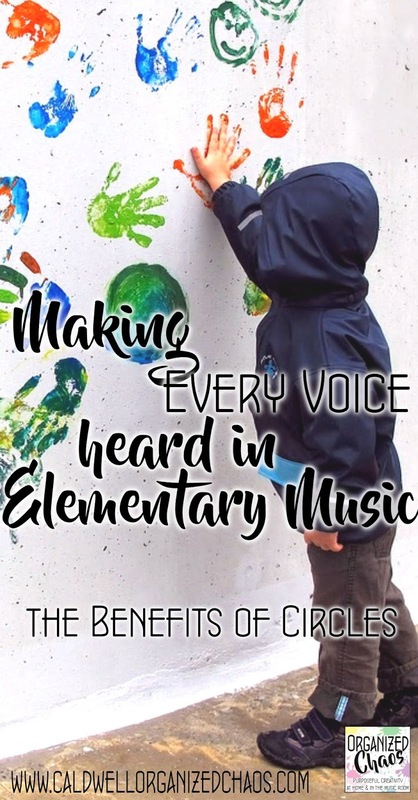 This can be a perfect segue or introduction to any lesson- if you're doing a song about winter, you can start by asking everyone what their favorite thing about winter is, or if you're going to be talking about major vs minor, you can have everyone tell you their favorite song and then go back later and discuss which one each of the mentioned songs are. Having these types of exercises built into your classroom routine regularly just gives children a sense of belonging, of feeling heard, of being valued. 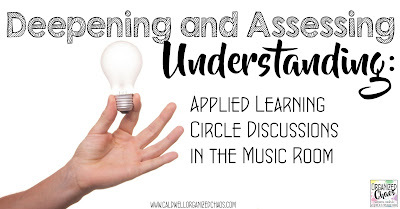 It's impossible for us as music teachers to keep track of who answers questions most often, who has gotten a turn on all the games, and on and on. This is one way to guarantee that each child has had an opportunity to be the center of attention and share something about themselves. Stay in touch and get timely ideas and resources sent to your inbox each month! Click here to sign up for the Organized Chaos newsletter! 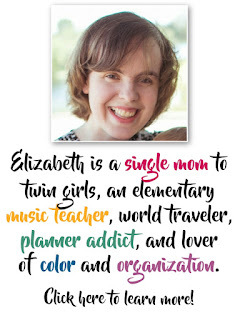 I love this, Elizabeth! What a wonderful way to build community and foster a sense of knowing our many students. My favorite part about this was that students have the option to "pass", but can then change their mind later. As a painfully shy student myself, I would've passed the first time, but felt more confident to try later after others had already spoken. Thank you for sharing! Yes, always! Or sometimes the first few people haven't had enough time to think, but if they pass they'll have more time to come up with an answer to give later. What wonderful ideas. I use circles to give each child a turn to improvise a movement or instrumental technique with rhythm instruments, but now I think I will try doing the verbal sharing also - a good way to learn more about each of my students! It's one of those things that I say I want to do before the school year begins, but when reality sets in, I just don't find the time for it. I'm hopeful that my making a conscious decision to prioritize this more this year it will become more routine so we can all reap the benefits of a more cohesive classroom community!